Activated charcoal is the secret ingredient for natural whitening and stain removal. It’s an oxidized version of charcoal and is the most healthy alternative for whiter teeth and gums without toxic ingredients, fluoride or bleach. Safely cleans and polishes teeth, strengthens enamel, improves gum health and freshens breath. Removes coffee, tea, wine and tobacco stains, naturally! Whether used as a standard toothpaste replacement, or in combination with your favourite paste, our tooth & gum powder is less abrasive than most store-bought toothpaste and safely formatted for everyday use. Most people see 2-3 shades whiter after 1 use. A natural alternative for whiter teeth and healthier gums without using fluoride, bleach, or any toxic chemicals. Safely cleans and polishes teeth, strengthens enamel, improves gum health and freshens breath. Removes coffee, wine, tea and tobacco stains, naturally! 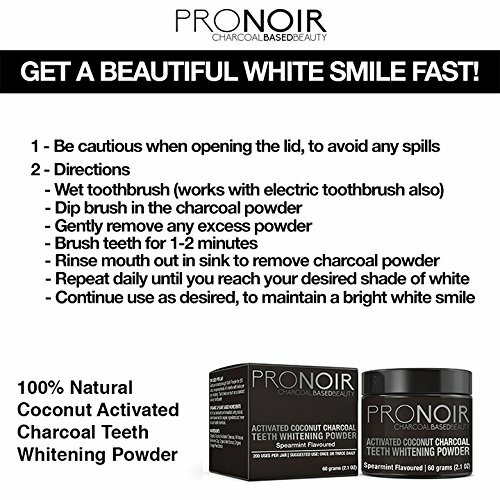 Pronoir Coconut Activated Charcoal Powder is less abrasive than most store-bought toothpastes and safely formulated for everyday use. Use in place of normal toothpaste to help increase your oral health while whitening your teeth. All of our products are formulated using natural, plant-based and/or organic ingredients and never include harsh chemicals. Our products will never be tested on animals. Pronoir Coconut Activated Charcoal Powder is offered in refreshing Spearmint, providing a pleasant taste and leaving you with fresh breath.